This antioxidant serum helps to restore a younger more youthful skin with improved collagen and elastin production. Magnesium Ascorbyl Phosphate is a stable high dose vitamin C molecule in a ph neutral formulation. Vitamin C has been shown to enhance collagen production and is a potent antioxidant protecting the skin from free radical damage. 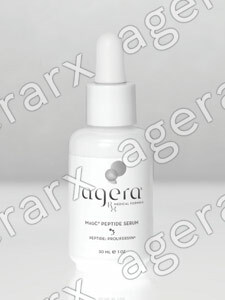 An Agera® Rx growth factor peptide complex enhances the production of collagen and elastin. A leucocyte extract helps to suppress unwanted pigmentation. Suitable for all skin types.